Ollie Petroskovic is finally going to pay his brother back for all the years that he's been there for him taken care of him been the parent that they both lost years ago. Signing the papers to purchase the home where Ollie and his brother, Nate will live. Where Nate and his future wife can raise their children. It's a fixer upper but Ollie knows that's what Nate would love a house that's a DIY dream come true. Ollie's sure that he's finally made their dreams come true. Ollie can continue his modelling and clothing design career while helping Nate with Petroskovic Haven Investigations, a house where they can be happy as a family. What no one saw coming was how the dream would come crashing down when Nate could no longer deal with the nightmare of PTSD and saw taking his own life as his only escape from it. A year later Ollie's struggling to try and keep what's left of that dream alive as he continues to work at the PI agency that was Nate's dream but without an Investigator's license it's a struggle that he's slowly loosing until Nate's friend Kade Alme arrives PI license in hand and tool belt strapped on. Kade's looking for to honor a promise made to his friend to take care of Ollie but he's also looking for his own fresh start. He's fresh out of the hospital with his own battle wounds but he's determined to make this work because for Kade that fresh start includes Ollie in his life in whatever capacity he can get him...if it's as friend and co-worker than so be it but if Kade has any say in things it'll be a far more intimate relationship than friend and co-worker. Ollie's pretty resistant to Kade's help and it takes a lot of patience and determination but Kade's got those in spades and before they know it the two men are firmly involved in a case as they try and help an old friend of Ollie's who seems to be in a lot of trouble. 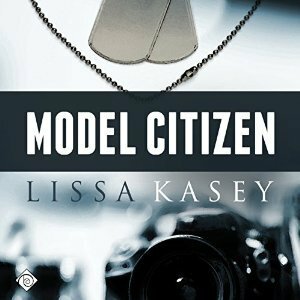 'Model Citizen' is a fast paced story with a lot going on. I loved both Ollie and Kade. Ollie appeared to be androgynous and identified as gender fluid, while his orientation is gay. Kade identifies as male and his orientation might be gay but to me it was more like he was Ollie-sexual because from the word go Kade was all about Ollie or maybe it was just the manties...nah, I'm pretty sure Kade was very into what was in the manties...mind you I'm just guessing. I loved how supportive he was of Ollie. But that didn't mean that he was a pushover where Ollie was concerned. Kade wasn't the least bit timid about standing up to Ollie when someone needed to but he also stood up for Ollie when someone needed to. I enjoyed the mystery in this one while there were things about it that were fairly obvious or easily figured out this story kept my interest from start to finish, so much so that as soon as I was done listening to 'Model Citizen' I jumped right into 'Model Bodyguard' because I wanted more. Mike Pohlable was the narrator for this audiobook and I have to admit I'm a little torn on the audio for this one. I really liked his voice for Ollie for me it aligned with Ollie's identity of being gender fluid. While Kade's voice didn't work quite as well for me, most of the time it was ok as were most of the other voices in the audio book but then there was 'Donovan' and I guess in some ways I would have to say his voice was good because for me Donovan was just an annoying little sh*t but really did he have to be such an annoyingly whiny little sh*t! Because there were times the whiny in his voice was way more than I could stand. As far as I can tell 'Model Citizen' seems to be this narrator's first audio book so I think I'm just going to sit back and see what the future brings before deciding yeah or nay with this narrator...who knows I may love whatever he does next or not but for now it's on to 'Model Bodyguard' and another new to me narrator.